There’s a book called “Like Water for Chocolate.” The main character, Tita, communicates her love and emotions through the food she cooks, flavoring each dish based on her feelings–hopes, expectations and desires. It wasn’t until this weekend that I realized I am, in this sense, Tita. I’ll be honest with you all. I was supposed to have a date Saturday evening. This was the first time in a very long time I was genuinely excited about a date. Cooking for someone I have found is something I guard as very private. It is my greatest passion and I don’t want to share it with just anyone. I invested a lot of thought into what I was going to cook for my date. 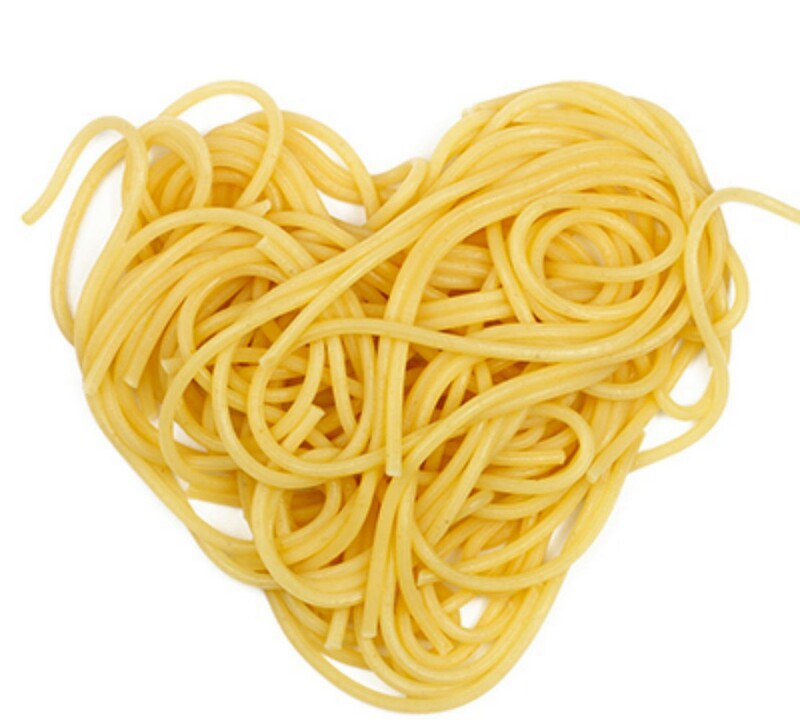 I knew we both had a love of Italian food, and wanted to pour all my effort into creating not only a casual and romantic meal, but a new dish that wasn’t defined by any recipe I’ve ever read. The menu: roasted artichoke salad with arugula, fresh mozzarella and olive oil; gnocchi with brasato al barolo ragu sauce; and limoncello panna cotta with blueberries. Let’s not forget a very expensive bottle of wine to top it off. I’m very fortunate to have a great group of girl friends who canceled their own plans for the evening to come and eat my dinner by candlelight, drink wine and go out to the bar. I will admit, I truly think this is the best dinner I have ever cooked. I felt pressured my cooking wasn’t going to live up to my guest’s expectations. I certainly had nothing to worry about. I don’t know when I’ll ever cook this again. Recipes can become both good and bad memories, just like a photograph. So enjoy this one for me and only share it with someone special (it does take two days to make after all!). In the meantime, I think my future dates are going to have to settle for Ellio’s Pizza slices out of the box (yes, the pizza you’re served in the school cafeteria) until I’m ready to share. 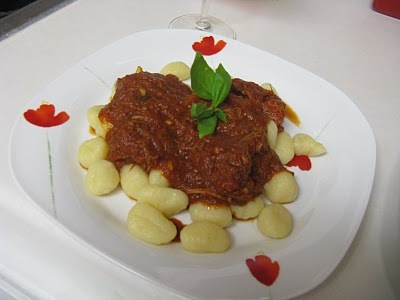 Note: Today’s recipe is Gnocchi with Brasato al Barolo Ragu Sauce. I will post the Limoncello Panna Cotta with Blueberries recipe on Tuesday, and the Roasted Artichoke Salad on Wednesday. The tomato sauce for this recipe comes from my Big Nona’s (great-grandmother’s) kitchen. My mom would say it tastes best if you prepare the tomato sauce at least one day in advance, cool completely and refrigerate before serving. In a large pot, coat the entire bottom with EVOO. Add the minced garlic, sliced onion and crushed red pepper. Cook on medium heat for approximately 10-15 minutes until onions are completely softened. Next, add the can of crushed tomatoes, stirring frequently scraping the bottom of the pot to keep the tomatoes from sticking. Cook for approximately 15 minutes until flavors can combine. Add tomato paste and two cans of water per can of tomato paste to the tomato base. Add salt, pepper, sugar and basil. Stir and cook until contents reach a near boil. Lower temperature to low heat and cover with a tilted lid, allowing steam to escape. This will help thicken the sauce. Simmer stirring frequently to keep from burning for 90 minutes. Cool completely and refrigerate. Place the beef roast in a large glass bowl. Add wine, onions, carrots, celery, garlic, rosemary, bay leaf, peppercorns and salt. Cover and refrigerate allowing to marinate for a minimum of 6-7 hours. Remove beef roast from marinade and dry completely, reserving marinade. Heat EVOO and butter in a large skillet on medium heat and add prosciutto. Once prosciutto has started to sizzle, place the beef roast in the pan. Brown and sear on each side for approximately 3 minutes. Remove beef roast from the pan and place in a crockpot or slow cooker. Pour reserved marinade into the slow cooker, plus chopped plum tomatoes and their juices, and cook for several hours until beef begins to “pull away.” Note: This took approximately 5-6 hours in my slow cooker. Begin to reheat the tomato sauce on medium heat. Once beef roast is cooked, slice and pull away the roast into shreds. Add the beef roast, carrots and celery to the tomato sauce. Simmer on medium-low heat for 1-1 1/2 hours. The meat will become more tender and fall apart in the sauce. Bring a pot of water to boil and cook gnocchi as instructed. Pour brasato al barolo ragu sauce over gnocchi, and garnish with fresh basil and grated Parmesan cheese.